1. Charlotte Douglas International Airport — Aside from rain during hurricane season, Charlotte, North Carolina has decent weather so you’ll not have to be concerned about being stuck. CLT is a USAir hub with gates that are fairly close to one another. USAir does a pretty good job managing connecting flights and making sure your gates are close together. If you’re switching airlines, you do not need to go through security screening from terminal to terminal. Finally, CLT has a decent food court. 2. Salt Lake City International Airport — Like CLT, SLC is pretty efficient where all terminals are connected. Salt Lake City doesn’t have much delays compared to Denver if you are choosing a connecting flight in the mountain region. SLC is great for Delta flights as it is their secondary hub. 3. Phoenix Sky Harbor International Airport — Although PHX is huge but weather is always on your side. You’ll never be delayed due to weather. Have ever you heard of bad weather in Phoenix? Ever? The downside to PHX is having to go from Gate A26 to B25 (see below) which is quite a walk. The trick is to look for one of the gate cart agents to give you a ride. Just tip the driver a few bucks and he’ll get you from gate to gate in a matter of minutes. PHX also has free WiFi service. 4. Atlanta’s Hartsfield-Jackson — Despite being one of the busiest airport in the US, I have never had any issues connecting in ATL. ATL’s terminal tram system is also fast compared to other tram systems (i.e., Denver, Houston, etc.). 5. Las Vegas McCarran. This is probably the best place to be stuck if you missed a connection. LAS has are plenty of machines (video poker, Wheel of Fortune, etc.) to keep you busy while you wait for your connection. If you’re stuck overnight, go try your luck on the Strip. In addition, almost every major airline has a non stop flight out of LAS. So worst case scenario is for you to bring your cancelled flight ticket to another airline and beg them to let you on their plane. For more information about our point of view on airports, here’s a list of the Top 5 Worst Airports in the US and the Top 5 Airports in America. While the answer should be “direct flights only,” sometimes work sends us to places where we don’t have the luxury of options. I’ve become an avid user of Hipmunk when it comes to booking complex travel, but have run across issues with what they deem to be appropriate layover windows. While Detroit (DTW) is a perfectly fine airport and getting from gate A1 to A77 is a surprisingly easy affair when utilizing the indoor tram, getting from Concourse A to Concourse C requires no less than several sherpas and a dune buggy. On a recent layover (connections on the same airline) I had 32 minutes to get from an A gate to a C gate. Only for the providence of a flight delay did I make my flight. 1. Can flight aggregators better predict sufficient layover times based on historical gate placement of flights? 2. 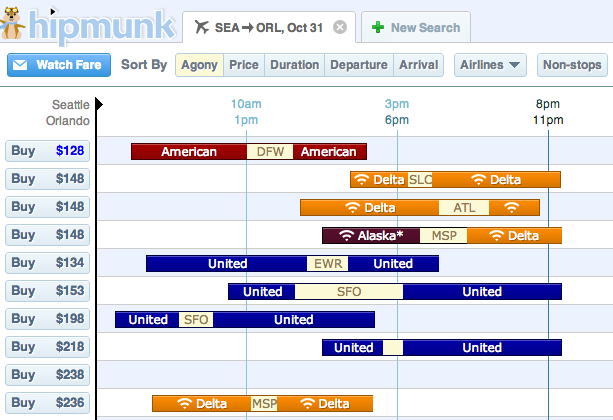 What is generally the right time threshold for a layover? 45 min? I have not flown United since retaining Premiere Executive status (thanks to United’s 2009 Triple EQM offer), and now I know why. I was recently on a United flight from America’s worst airport (IAD) to JFK. I got to the airport a few hours early and wanted to go standby for an earlier flight. After checking in at the kiosk, I tried to get on the standby list via “get on an earlier flight option” from the kiosk. The kiosk requested I swipe my credit card and notified me that I would have to pay $50.00 if my standby was confirmed. As an United Premiere Executive for many years, I stood there staring at the screen in disbelief. After getting through Dulles’s horrible security checkpoint and train, I finally got to the United Customer Service desk. When I inquired about standing by for an earlier flight, I was told that it would cost me $50 if I get on to the flight. When I told the United Customer Services agent that I was never informed of this new policy, she informed me that it was put in place February of 2010. The United Customer Services agent was also shocked that she had to ask for my credit card when she noticed that I was a United Premiere Executive. Still in disbelief, I rang United Customer Services’ number and was connected to their Indian call center. The offshore United Customer Services agent told me United began charging $50 for taking an earlier flight and the only way around it is if you’d a full fare ticket – not even Premiere Executive members are spared of the fee. I dug through United.com and found this article (link for your reference). I believe Premiere Executive 1K and Global Services members can get the standby fees waived. I now know why I have stopped giving United my business as being a loyal customer doesn’t pay. 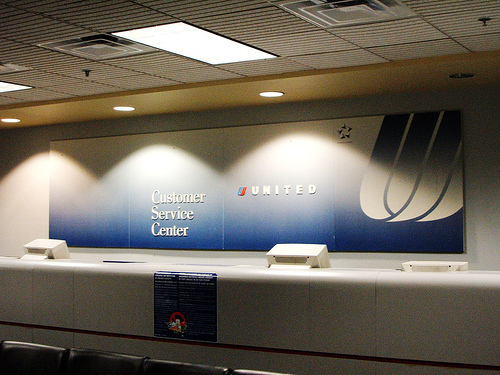 United’s learned from USAir by charging their customers for standby when their planes are empty (perhaps charging for water on a flight is next – see previous post about USAir). United’s latest customer gouging approach makes Delta’s poor customer service and trying to squeeze every penny from you at JFK seem harmless. Now I understand why I have been flying Delta more and more, especially when they offer “confirmed” standby within 4 hours of the flight. Yes! If you’ve Delta Medallion status, they’ll give you a seat on the flight 4 hours in advance or within 4 hours of the next flight if you’ve missed your earlier flight. No wonder I wrote this previous article (Delta’s Medallion Program puts them above other airlines).